This week I felt like the perfect place for my shenanigans to unfold would be, well, Shenanigans Irish Pub. 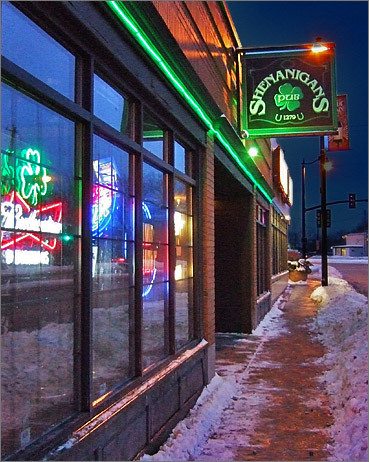 Shenanigans is located on the east side of Green Bay off Main Street. I really didn't know what to expect with this particular bar, I just thought another sports/dive bar. Let's just say I was wrong, way wrong. I mean, yes, it's a sports bar in the sense that you can see every sport game imaginable PLUS they sponsor the Green Bay Bullfrogs in a way. If you bring in your ticket stub and empty beer cup, you get a free drink. How cool is that? Seeing how I like to go to the Bullfrogs' games and I like beer, putting those two things together will make one happy lil' mama. But Shenanigans is much more than your regular sports bar. First of all, it's pretty in there. The bar part is made up of dark wood and the wood makes it quite charming. The same dark wood is wrapped around the perimeter walls making it two-toned with a lighter paint shade on top. That creates such a warm atmosphere for you to lounge around in and hang out. When you walk in, there's a left hand side with pool tables and a shuffle board, the bar part is in the center and on the right hand side are hi top tables for you to sit at. And the windows are all on the front side of the whole place and it's just like a wall of windows. Another awesome feature of Shenanigans is their happy hour specials. There are seriously too many to keep track of. It's like the Happy Hour of all Happy Hours. So what kinds of specials are there for this HH2? Well, it runs every day from 4PM to 8PM and it features $1.25 Domestic bottles and taps, $2.25 Import bottles, $2.50 Import taps, $2.00 rail mixers (Heeelllo vodka soda! ), $2.50 call mixers, $3.00 martinis and I know I'm forgetting it more of them. But if any of those I mentioned don't appeal to you, then its best that you stay at home and not go out. Ever. Oh, also on Tuesdays they have free pool, which is cool. But I'm terrible at pool which is not cool, but with free pool maybe I can become a pool shark.